We have established a novel human tissue resource where we obtain multiple tissue samples from human organ donors through a collaboration and research protocol with LiveOnNY, the organ procurement organization for the New York metropolitan area (see Carpenter, 2018 for a description of the donors and this resource). We obtain multiple lymphoid, mucosal and exocrine tissues from donors of all ages of life, enabling unique investigations into how immune cells are distributed across the body and through the entire human lifespan. We initially focused on investigation of human T cell subsets including naïve T cells that emerge from the thymus and populate lymphoid tissues, different memory T cell subsets that are generated after exposure to diverse antigens, pathogens and commensals, and regulatory T cells that arise in the thymus or the periphery (Thome, et al 2014, 2016). We found that in all donors, T cell subset composition is a function of the tissue site, with predicted age-associated changes in certain sites. Notably, the accumulation of memory T cells occurs at different rates in distinct sites—most rapidly in testiness, followed by lungs and spleen, with lymph nodes showing gradual memory accumulation and the highest maintenance of naïve T cells over life. We are currently investigating the factors and mechanisms for compartmentalized aging of the immune system, and are using imaging approaches for microanatomical dissection of dynamic age-associated changes in immune cells. We are also examining the distribution of innate immune cells, including dendritic cells (DC) and NK cells in tissue sites over age (Granot, 2017 and unpublished) toward a complete mapping of the human immune system over space and time. In 2011, we reported the identification and isolation of a subset of influenza-specific memory CD4+T cells in the lung that were generated in response to infection, were irreversibly retained in the lung tissue, and mediated optimal protective responses to influenza compared to circulating influenza-specific memory CD4+T cells (see Teijaro, et al, 2011). This cell subset, now referred to as Tissue resident memory T cells, or TRM for short, are found in most tissue sites with prevalence in mucosal and barrier sites (intestines, lungs, female reproductive tract, skin), within both CD4+ and CD8+ lineages, and can be generated to site-specific infections by diverse pathogens (viral, bacterial, parasites), and by site-specific vaccinations. 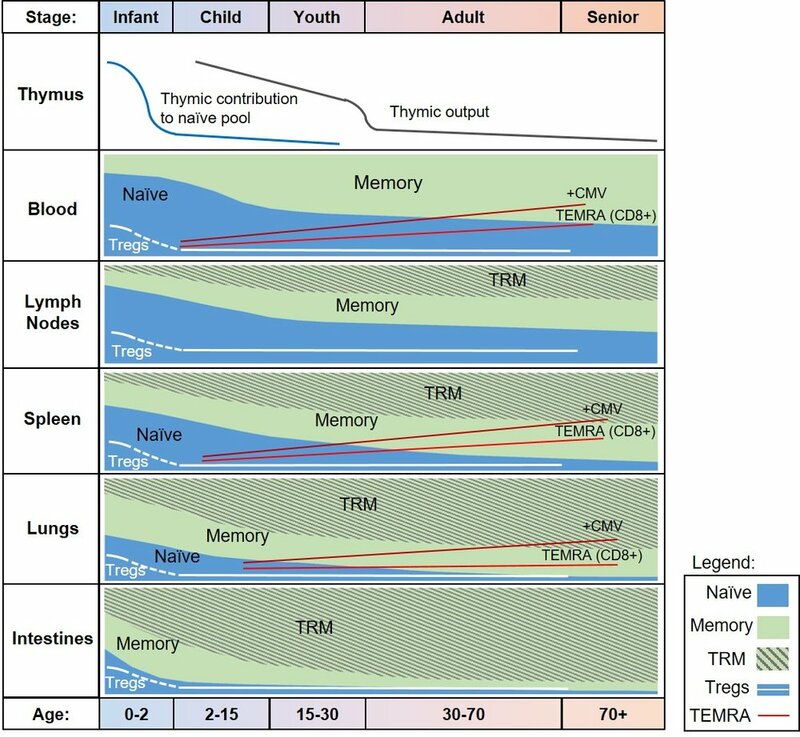 In humans, the majority of memory T cells in the body throughout decades of life are TRM-phenotype. We are interested in dissecting the mechanisms by which TRM are generated to infections and vaccines, are maintained in tissues and mediate protection to pathogen infection using mouse models and human tissue samples. In mouse models, we have defined transcription factors required for CD4+TRM generation to influenza infection in the lung, and mechanisms by which TRM mediate rapid recall responses in situ (manuscripts in preparation). These studies are informing examination of lung TRM in vaccines, to identify requirements for optimal establishment of protective TRM (Zens, et al, 2016). In our studies on human TRM, we used whole transcriptome profiling to identify a core gene signature that defines TRM in multiple tissue sites, including mucosal and lymphoid tissues (Kumar, Ma, et al, 2017). In our current studies, we are defining tissue-specific attributes of memory T cells within lymphoid sites (Miron, et al, submitted), intestines and the pancreas (unpublished), and the functional heterogeneity of human TRM and their responses to activation (Kumar, et al, submitted). Our studies have extended to investigations of TRM in disease, both in transplantation and tumor immunity. At birth, humans emerge from a largely sterile environment to one where they rapidly encounter multiple, diverse antigens through multiple sites, particularly the respiratory and digestive tracts and skin. How the neonate balances the conflicting demands of generating responses to pathogens but not to innocuous antigens such as those derived from food and commensals is not well understood. Moreover, infants experience disproportionate morbidity and mortality from pathogens which infect mucosal sites and exhibit reduced responses to vaccines—these features of infant immunity has been previously attributed to the immaturity and hyporesponsiveness of infant immune cells. However, there is increasing evidence that immune responses during early life can provide efficient protection by the generation of effector T cells, but that infant T cells are intrinsically programmed for distinct types of short-term effector responses over memory generation. We are investigating how infant immune responses develop in mucosal sites using an infant mouse model of influenza infection, in respiratory samples obtained from infants with viral respiratory tract infection (VRTI), and in human tissue samples obtained from pediatric organ donors. We recently reported in mice, that influenza infection during infancy resulted in a robust lung effector T cells response, but reduced generation of protective lung TRM compared to adult infection, due to an altered transcriptional program of infant T cells mediated by enhanced expression of the T-bet transcription factor (Zens, et al, 2017). In human infant VRTI, we similarly found a robust effector T cells responses in the airway during virus infection, but reduced generation of TRM that was developmentally regulated (Connors, et al, 2016, 2018). In tissue sites, we found establishment of TRM specifically in lungs and small intestines during infancy, with lymphoid and other sites largely populated by naïve T cells and regulatory T cells (Tregs) (Thome, et al, 2016). This early predominance of Tregs over memory T cells in tissues may enable tolerance induction and enhanced regulation of potentially harmful immune responses during the critical window of early life. We are currently investigated mechanisms for the distinct features of Tregs and TRM cells from infants, and are using imaging to define the precise in situ differences in infant compared to adult tissues. Finally, we are exploring the possibility that memory T cell compartmentalization to mucosal sites could arise from in situ priming. All human harbor multiple types of persistent viruses, which are never completely cleared by the immune system following an initial infection, but persist in latent or subclinical forms in different parts of the body. Cytomegalovirus (CMV) is a persistent herpesvirus present in the majority of individuals, and requires ongoing immune surveillance by T cells and innate cells to be controlled. Importantly, individuals who are immune compromised due to viral infection or aging or immunosuppressive medication for transplantation and chemotherapy, can experience CMV reactivation, disseminated infection and end organ damage. In immunocompetent individuals, CMV has been associated with increased immunosenescence, differential responses to infections or vaccinations and even all-cause mortality. While previous studies on human CMV immunity have focused, by necessity, on immune responses in peripheral blood, the diverse tissue involvement and life-long persistence indicates that a broader approach is needed to examine CMV immunity throughout the body and over the course of the human lifespan. Using our tissue resource, we have identified active sites for maintenance of CMV-specific T cells, and that lung and lymph nodes are major sites for CMV persistence (Gordon, et al, 2017). Together, these findings indicate tissue-specific control of viruses and suggest effects of persisting CMV infection on innate and adaptive immunity. We are currently investigating how CMV impacts T cell and innate cell compartmentalization in tissues sites, and how anti-CMV responses in certain tissue sites are related to those in circulation by high dimensional, single cell approaches. See HIPC Body Page.